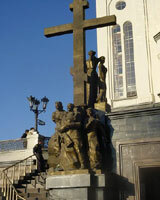 Tours to Ekaterinburg. Travel to Ekaterinburg. Legend tour. Tours to Ekaterinburg. Travel to Ekaterinburg. Yekaterinburg. Sverdlovsk. Legend tour. Ekaterinburg (Yekaterinburg) can be easily found on the geographical map of the vast Euro-Asian Continent: it is in the middle of the Ural mountains, which separate Europe and Asia. Thus, Yekaterinburg (Yekaterinburg) lies at the crossroads of 2 continents and it determines its political, economic and cultural peculiarities. It is surrounded by forests (taiga) and small lakes. 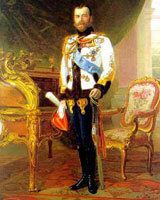 After Ekaterina, the wife of Peter the Great, the city was given a name Yekaterinburg. Yekaterinburg today is a beautiful city. Current population is about 1.5 million people. The city has tram, trolley, bus routes and subway. There are more than 200 schools, 50 technical schools, 14 higher education institutions, including the Ural State University, founded in 1920; the Ural State Technical University, with more than 25,000 students, Yekaterinburg medical institute. Nine local TV channels and a lot of radio stations broadcast their programs in Yekaterinburg and Sverdlovsk region. There are six theatres, inluding Opera theatre, the circus, four stadiums, several concert halls and museums. More than 600 monuments of history and culture are located in the city, and 43 of them are considered to be top national monuments because of their special significance. People often find it confusing that Ekaterinburg (Yekaterinburg) city is known by several names. from 1921 to 1991 the city's name was Sverdlovsk and ones with the older maps should look for this name instead of Ekaterinburg (Yekaterinburg). After the Russian revolution of 1917 there were new heros and Sverdlov, one of communist leaders was one of them. So, the old city of Ekaterinburg (Yekaterinburg) was re-named after him. After perestroika has started people founded out about Sverdlov's involvement in assasination of Tsar's family and many unpleasant facts of his revolutionary activities. So, the city government decided to return the historical name of Ekaterinburg (Yekaterinburg) to the city. 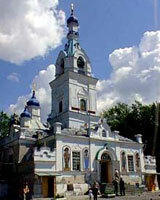 The town was foinded in 1723 by Peter The Great order and was named after St. Catherine. Peter's daughter's name was also Catherine, who later became Catherine The Great, the Empress of all Russia and did many good to the country. The German spelling of Yekaterinburg is Yekaterinburg though this version is not so widesperad as the first one. There is no universal rule on how to transliterate Russian names in other languages, so there are variances. Yekaterinburg is the major city, said to be the third largest in Russia. Though is not a major tourist center yet. It was closed for foreign visitors for many years and was "opened" only in mid ninetees. It has lots of industry and business opportunities as a result. More and more overseas visitors come to visit Ekaterinburg every year for business and pleasure.